In 2003 and again in 2008, Kansas City passed a 3/8-cent transit sales tax in order to build a bigger better bus system. It was a package deal: the 3/8-cent transit tax would add to the already existing ½ cent transportation sales tax (which previously had been the only source of funding for the Metro) to provide KCATA with the equivalent of 7/8 cents sales tax for operating the Metro. That is NOT what happened. 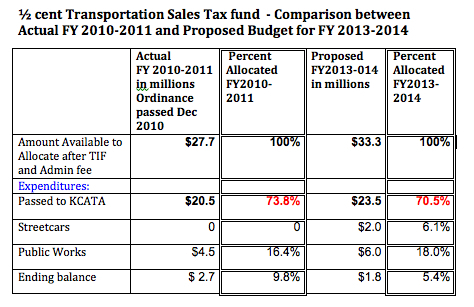 In the City’s proposed budget for FY 2013-2014, KCATA is getting less than 6/8 cents in sales tax. The city is diverting nearly $10 million away from KCATA even though they are violating Ordinance 100951 to do so. For the proposed FY2013-2014 budget, 1/8-cent sales tax generates a little over $8 million. If the city was obeying the ordinance and started incrementally increasing the KCATA share of the ½ cent transportation sales tax in May 2011, then KCATA would be getting about $6 million more in the FY 2013-2014 budget. If KCATA only got $5 million more in this budget, they would not have to bleed out the reserve account to maintain service. Saturday is the last public budget hearing to comment on the city diverting money away from KCATA despite the clear intention of voters that the full 7/8 cent of sales tax should support the bus system. However, continue to contact the mayor and your council members though March until the budget is adopted. Where is nearly $10 million going in the proposed budget instead of to KCATA? The previous two years, the city hoarded over $5 million in the fund rather than pass the money on to the KCATA. At this point, KCATA is not going to get one more dollar than it did this year. This diversion of tax money away from the KCATA is not new. This is why in 2010 we approached the city to pass an ordinance that required the city manager to give 95% of the ½ cent transportation sales tax to KCATA by May 2014, and to start incrementally increasing the KCATA share of the money in May 2011. This ordinance meant the city would comply with the promises made to voters in the two earlier elections. Instead the city has violated the ordinance every year. KCATA is getting a smaller share of the fund than it did in 2010. The KCATA share has gone from 74% down to 71%. Voters should understand that legally the city could trash Ordinance 100951 and totally ignore the two elections and give all the ½-cent transportation fund to roads and streetcars. Voters never get to vote on this money since it is taxing authority given to the city from the State of Missouri. That is why we approached the council in 2010 and tried to protect the bus service from encroachments from other projects by passing the ordinance. Up to this point the city has chosen to flagrantly ignore that ordinance. In fact, the city manager is already saying he wants the council to change the ordinance. One possibility for changing the ordinance being openly discussed is to allocate $2 million to the streetcar off the top and let KCATA have 95% (or less) of what is left. No matter how great it is to have a streetcar and give more money to roads, the bus system still has to carry the heavy load of transporting nearly 55,000 people daily to work and home and all their other transit trips. And KCATA ridership is increasing. Kansas City is huge geographically and it takes a lot of money to transport people over all these miles. Continue to shrink the money, expect to shrink the service area and service level. For a change, we would prefer to see KCATA fully funded and get MAX systems added to Prospect and North Oak, instead of having to cut service in a couple of years. There are consequences to the city’s actions. The city council still has time to fix all of this. Do they have the will? 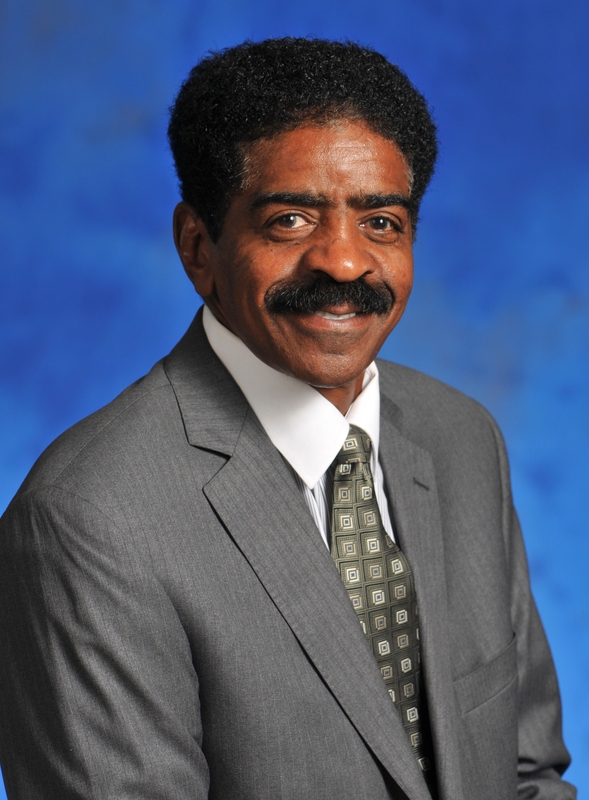 Some of the council members do, such as Ed Ford and John Sharp. Please contact the mayor and the city council and let them know what you think about taking all this money away from the Metro. Enjoy the first KC Downtown Streetcar Open House in Union Station’s Grand Hall. The event is hosted by the City of Kansas City. Detailed exhibits will be on display illustrating the two-mile route, including information about construction, station stops and the vehicle maintenance facility. No presentation will be made so visit anytime during meeting. Construction is planned to start in late spring or early summer, so property owners, business owners and residents along the route are encouraged to attend the meeting and share their thoughts and concerns with representatives of the City and the consultant team. For more information about the project, visit the Downtown Streetcar website at http://www.kcstreetcar.org for updates on the project and road closure and detour information. You can also call the streetcar hotline at 816-822-3011. TAN asked all of the candidates for Mayor of the Unified Government of Wyandotte County/Kansas City, Kansas to answer questions about transit to help voters understand their positions on this critical issue. We appreciate candidates Janice Witt, Ann Murguia, Mark Holland and Nathan Barnes for talking the time to respond to our questionnaire and sharing their philosophy, vision and ideas on transit. We have chosen questions on Transit Philosophy, Funding, Meeting Increased Transit Demand, KCATA, and Creating a Transit-Friendly Environment. The whole document with all the responses can be downloaded at the end of the article. Be sure to send this article to citizens of Wyandotte County so they can be informed about the candidates’ positions. Transit is a major issue in Wyandotte County since there is significant demand for a good transit system from the citizens. A. What do you see in the future for transit in Wyandotte County? JW – I see a beautiful transit system that is clean, efficient and respectful. One that is conducive for everyday riders to commute from and to any community or destination without trading their self- respect for a ride. I see beautiful, respectful and functional covered bus stops/landings with time and information accessible and powered by solar energy to maintain the positive green effects of the use of transit instead of personal transportation. AM – We need to create the kind of public transportation system that incent ridership. I think we are off to a good start with the $10 million grant we received to improve the State Avenue corridor, but we need to do more. MH – I think we are going to have to be very creative in addressing the needs of our community. State and Federal funding has been under attack, and these funds are essential to providing the level of service necessary to serve our community. My hope is to improve access to transit. I supported the “Complete Street” initiative that calls for more sidewalks. Without access for people to walk to the bus from their neighborhoods, it becomes very challenging to increase ridership. NB – Under my administration I see Wyandotte County a fully integrated system with more routes and bigger buses. B. Do you support continued county funding of public transit as an essential service throughout Wyandotte County? JW – Yes, without transit the small businesses in Wyco would have no means to acquire manpower other than personal transportation. Without transit the poor will remain in the cycle of poverty because of a lack of transportation. If they have no access to fresh groceries and further education, the cycle of poverty continues. Without transit there will continue to be a drain on mental well-being, health outcomes and isolation issues that plaque Wyco. AM -Yes….many WYCO residents depend on public transportation to meet their daily needs. The government needs to assist in developing a quality state of the art system that will create such demand, that over time, through ridership, will pay for itself. MH – Yes. I wish it were stronger, but I believe there will always be a need for a local match for State and Federal funds. NB – Yes. It is a city and county issue and our city and county should address funding. C. Federal funding is dramatically decreasing for ALL transit. A decrease in State transit funding is also a possibility. Should Unified Government replace these lost funds, both capital and operating, in order to maintain the current level of transit service? JW – I believe that there should be a small percent sales tax added in KCK, so that we can build ourselves the transit system that we need to make our community mobile and viable to incoming business, homeowners and new adventures both into the Northeast and our entire community. Edwardsville, Turner, Bonner all of these surrounding communities that are considered any part of KCK should have access to the positive effects of mass transit. It helps us all in the long run. I also hold no aversion to a bi-state tax and joining the concept of a regional transportation authority to give smooth, efficient service to all of our communities. Why do I find this acceptable? Because right now as we speak, Schlitebahn has a proposal before our commission to tax an additional 2% sales tax to build on to their already subsidized private venture waterpark. This has ZERO benefit to the everyday citizen of Wyandotte County. It is a personal or Corporate business expense that is being added on the people who will then have to pay exorbitant fees to get into the water park even though they have paid for it twice now at the cost of our fair grounds which gave Free access to the people of this county to educational and social experiences. Unlike a bus system, which would give access for minimal fees to anyone who needed transportation hopefully anywhere in KCK, JOCO or KCMO. AM – I don’t think government is our only option when it comes to public transportation funding. The philanthropic community has a lot of interest in seeing a more healthy Kansas City. I have good relationships with this community and would hope to be able to work with them and private business to offset some of the costs associated with developing a quality transit system that over time could sustain itself. MH – We are facing State and Federal funding cuts in numerous areas. Transit is one that is heavily dependent on this funding. It would be nice to say that we will not cut services, but the reality is that if this is not a national priority we will be hard pressed to replace the loss dollar for dollar. NB – Yes.The transit system is currently under funded. The least we can do is to keep the funding going. I will take Wyandotte County from the welfare mentality to the understanding that it is our responsibility to fund basic transportation. A. Currently local transit funding in Wyandotte County comes out of General Revenue Funds. 1. What local transit funding mechanisms do you think are best for Wyandotte County? JW – I believe that there should be a percent sales tax especially in the number one tourist destination in the state of Kansas. There must be some benefit to the citizens of this county. AM – I think there needs to be new ideas in addressing funding for transit. This is a long-standing problem for governments across the metropolitan area and nationally. As I said above, I don’t think government is our only option when it comes to public transportation funding. The philanthropic community has a lot of interest in seeing a more healthy Kansas City. Public transportation promotes a healthier lifestyle. I would hope to be able to work with charitable organizations and private business to offset some of the costs associated with developing a quality transit system that over time could sustain itself. 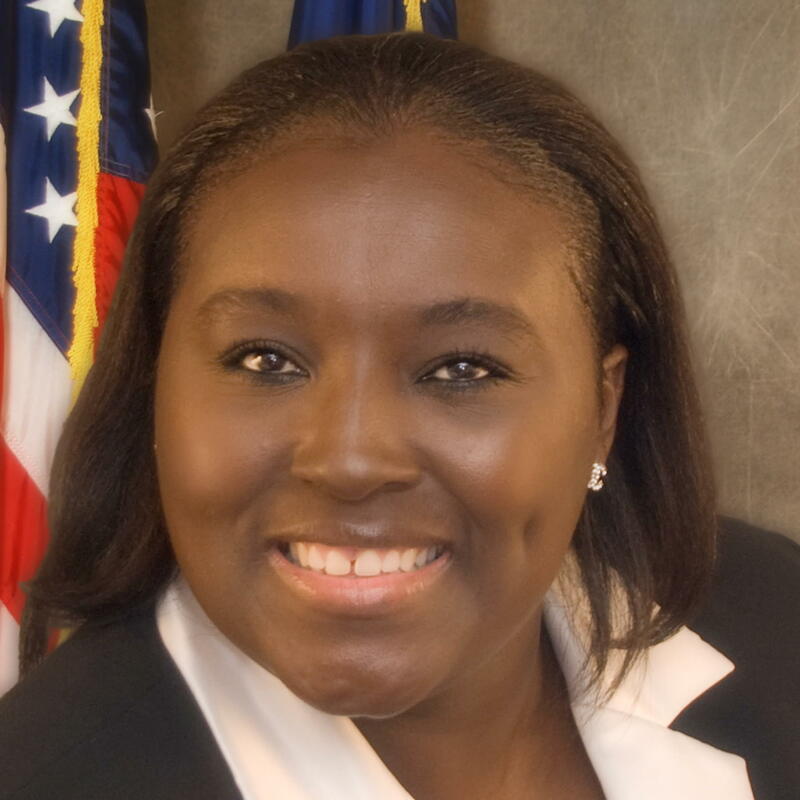 MH – I think General Fund dollars are the best place for this fund. NB – A dedicated sales tax. 2. Would you consider a small county-wide transit tax to help sustain the transit system Please explain your reasoning. JW – What I would consider is this, the bulk of the transit that is necessary at this moment involves the Legends area and transit for the dwindling population of the Northeast and other areas to get to the businesses in the West and the KU area. The specific serviced section of the community will bear the brunt of the cost over the long run every day by using the service and paying standard fees. It is my opinion that, the business districts that benefit are the areas that should bear the bulk of any percent of tax increase, as the citizens would also be included in the revenue from the increase in purchases made in that area. If a separate tax district could be utilized to ensure that the small businesses of our general community are not harmed by this increase I would not be against it. But my mind is open, this is an issue that needs to be at the forefront of conversation, but I need more information. We are taxed to support abatements for corporations but never given the opportunity to support ourselves. I do not believe the people would have a problem with this if they could see and use the benefit. AM – I think any time we talk about taxing the people in WYCO that needs to be placed on a voting ballot. MH – That would not be my first choice. When we unified the government 16 years ago, we brought a whole plethora of “special taxes” back into the General Budget. I understand the thought that it looks like more of a priority if it stands alone, but I think it is unnecessarily cumbersome in annual budgeting process. NB – Yes.With decreasing federal funds it is the only choice. B. Transit demand in Wyandotte County continues to increase. How and where would you get additional local transit funding to meet the increasing demand? JW – Small percent tax approved by the citizenry. AM – I think it is simple supply and demand. As transit demands increase our product will become better and ridership will increase and therefore revenue from riders will increase. MH – I think this is where we need to be creative. It is very difficult to put the cost on users, who in our particular community are often the least able to support it. We need to continue tracking which lines are running at capacity and which ones are not. Are there areas where we can expand call for service? Are there areas where we can run smaller vehicles? We need to keep in mind the goal of transit is to get people from point A to point B, not just to run buses. NB – I will get additional local transit funding to meet the increasing demand from Sales Taxes. 1. at the state level? AM – On many occasions I have been successful in reaching across party lines and will use that experience to lobby for public transportation. MH – We need to continue to lobby for State funding based on ridership and not on population. This is one of the biggest challenges. Transit money should follow the need, not the area. 2. at the federal level? AM – Again I have good relationships with our elected officials on the federal level that will allow my voice to be heard for the people of Wyandotte County. MH – We need to continue to engage with regional lobbying efforts. These collaborative conversations with the entire Metro area will yield far better results than if we go individually. I think the ongoing success of KCATA is the best hope Wyandotte County has for more funding. JW – The very best that I can! Those who know how this should be handled will give me guidance and I will follow their lead. I am not a micromanager. I believe that people gain the knowledge, skills and abilities to do the job that they are hired to do. As a manager I would ensure that we had the proper staffing with the proper tools to do the proper job and make the right decisions for the greater good of this community. It is my job to educate myself to their findings and support their position. In my opinion if I cannot trust them to do all of that, then I have failed as their leader. I would educate myself further, follow their lead since this would be their field and be support to good strong decisions on the local, state and federal levels. NB – I plan to Lobby efforts at both state and federal. A. Areas such as Rosedale, with very limited transit service, are trying to get additional service to meet the needs of its residents, many of which are transit dependent. What process should exist and/or what criteria should be met in order for residents to get new or expanded transit service? JW – I would want more info and there is not enough time for me to make myself familiar enough to make a statement in section 3. AM – I think we have many great opportunities in Rosedale specifically to improve transit in some very creative ways. We already have a great relationship with University of Kansas and I definitely think involving them in discussions about public transportation can help improve services for that area of WYCO. But do not forget that there are other areas that struggle to get their fair share of public transportation like the Turner area. Those residents tax dollars pay for that service yet they receive nothing for it at this time. This situation needs to be addressed as well. MH – Again, creativity. Is there a way to add call for service? How can we partner through KCATA and the Jo, leveraging the proximity to KCMO and Johnson County? NB – I must gain the true picture of the needs of the residents and then act on what is needed. Convene a meeting or meetings to address these individual concerns. B. Route 101 will change to the Connex service later this year. Will you make sure that the upgrade in service level is enough to alleviate the current overcrowded conditions, without negatively impacting other services? AM – As to the details of the routes, we hire professional transit staff that make those decisions. These are not made at the Commission level. I have confidence in our staff and their ability to manage over crowding without impacting other services they provide. MH – Absolutely. It looks like this improvement will make a huge difference. NB – I pledge to aggressively pursue answers to address these concerns. A. What characteristics would you look for in making appointments to the KCATA Board of Commissioners? JW – I believe that anyone appointed to any commission should have a genuine interest in the community. Not just be there to fill a seat. I am looking for constant results from appointed commissions. If nothing is being changed. Nothing is being done, because no one is perfect and there is always room for improvement and we should be finding it by listening to the citizens. They will surely tell us the problems and maybe even how to fix it if we listen. AM – I believe that the characteristics of the current Board members are what we need to maintain in the future. MH – We need collaborative, regionally minded individuals who have a heart for all the benefits transit brings to the people and the environment. B. Unified Government currently contracts with KCATA for only 90 days at a time. This policy gives a negative impression regarding the stability of the transit system in the county. What needs to happen to return to a full year contract like other municipalities? JW – Committed long-term relationships based on honesty, respect and concern for the people, no exceptions. If we all care about the people that are riding on the transit including the drivers safety, comfort and health issues, there should be no room to have an issue. The bottom line is that as a business we all have to make money in order to maintain viability. But when the actual product is service and the people are the consumers of that product sometimes the measure for error and success becomes clouded by opinion, personality and politics-I think this is a mistake. I think we should set very specific service guidelines to service both the inside consumer and the outside consumer then let those perimeters establish a rock solid acceptable standard of service for us all. Including a long-term agreement with the KCATA so that the future and expectation for everyone is clear and the repercussions established, should those benchmarks not be met by either party. NO GAMES! AM – This is a staff decision and I would need to consult with staff to better understand why we are contracting in this manner. MH – This looks like a reasonable request. I would need to speak with our team at the city to see why this policy is in place. NB – An open discussion. Most commissioners are not aware of this. C. Would you consider contracting with KCATA for all fixed route services? Please explain why or why not. JW – I love the idea and we will have a Transit friendly environment and I believe that KCATA will be the organization to ensure that, that happens. However, I cannot say yes or no to this question at this time since there would have to be in my opinion an opportunity for local business to play a part…potentially managed by KCATA in the growth of transit in the area. It was the mini bus of my childhood that was a privately held company that actually brought transit back to the grasp of those of us country bumpkins that lived in the west in the early 80’s when there was no transit service available. I rode the minibus to and from school during a very specific period of my life. So…I cannot say that I would close small business access to All transit routes without looking further into what that would mean to this community and the potential of other small businesses relocating here to assist in transit service. My crystal ball is cloudy on that one, lol. Ask me again later after I do some research-my mind is always open to offer the best service possible to humanity. AM – Again, this is a staff decision and I would need to consult with staff before making any changes. MH – With the State and Federal spending cuts, I don’t think we can take anything off the table. This would have serious considerations for our UG employees and I would not do anything without seeking assurances about their future. Again, we need to be creative in how we serve the community. NB – Once all of the information is presented to the Unified Government I would review the pros and cons of the issue and make a decision. I do believe that the current bus system in Wyandotte County should play some part in that system. MH – We are looking at residential developments in and around the new 7th street transit center downtown. The more we can foster “transit friendly” development and encourage growth nearby, the better. We are also looking for a major redevelopment at Indian Springs around the new transit center there. I think the strategic location of this center automatically makes Indian Springs a new kind of destination. NB – Regular updates to the powers that be. MH – Coordinating routes with businesses and restaurants to make sure the buses are running at the right times for opening and closing. This makes the use of transit a more organic, and less onerous option for the employee. NB-Make the case for why they should be a part of the discussions and the solution. JW – Retraining in proper customer service and the emphasis on positive outcomes for the customers experience while in transit care. Service is a product. It must be fine tuned constantly to ensure good relationships and long-term viability of business ventures. Especially when the effects are of detriment to healthy lifestyles and a healthy planet. Many times the bus driver will be the only connection to the welfare of some riders. They need to be empowered to be safe consumers of their own product but have the authority to demand change to benefit the entire experience. I think answering the needs of the drivers, mechanics and service vendors of the buses will alleviate stressors that can cause frustration with a frustrated public. AM – I currently use our transit system on occasion and I find it to be a very friendly environment. However, I am sure there are always ways to improve and in order to know how to create a “more” friendly environment we need to ask the people using the current system on a regular basis. Rosedale, a neighborhood in Kansas City, Kansas, is working to expand transit service on SW Boulevard in order to meet the needs of its community. Feel free to come to the meeting and share information, make suggestions, or find out more about the project! Missouri recently introduced legislation, which would radically change the way the state collects and spends transportation funds. It could have a major impact on the prospects for transit, at least in the two major urban areas in the state. The sales tax will generate about $7.9 B over the ten-year period. 10% will be taken off the top and split evenly between cities (5%) and counties (5%) for new funds of about $79MM annually. This would represent about a 30% increase over current receipts from the fuel tax alone. $1.1B of the tax would be dedicated to rebuilding and adding a lane in each direction to I-70 between Independence and Wentzville. After funding Federal matches, MoDot would be left with about $5.5 B over the ten years. This would be distributed to each of the MoDot regions. The Kansas City Urban Region, essentially MARC’s boundaries, would be in line for $933MM over the period in NEW transportation funding. Cities, Counties and MoDot regions (MPO’s in urban areas) would have complete autonomy in how these funds are spent. There is no set aside for any particular mode (except for rebuilding I-70). In theory this is NOT a highway bill, but it will depend on the project selection process. Is This for Real? How likely is it that the proposed legislation will get passed and approved by voters? We don’t know, but here is current data as of February 8. In the General Assembly the legislation had attracted 18 co-sponsors; a good indication of likely passage. Initial hearings are scheduled for the 19th and 20th of this month. The people we spoke to at MoDot were divided with one person calling passage a slam dunk and the other less sure. The legislation would simply allow a public vote on the proposal so how likely is the measure to win at the polls? Polling done in December of 2012 related to transportation needs showed that 52% of likely voters would approve the measure. This rises to 54% if MoDot proposes a specific list of projects – hence MoDot’s “listening sessions.” The legislature and Governor are constitutionally prohibited from using the funds for anything other than transportation. It is generally believed by professional campaign organizers that 54% is not a healthy margin of support, so a positive outcome at the polls is most certainly not assured; but, nevertheless possibly within reach. Some people feel these percentages are optimistic when general state needs are considered rather than just transportation needs. 1. The legislation is by no means fully baked so there is an opportunity to shape it (maybe “tweak” is a better word) to transit constituents’ benefit. There are still many issues yet to be determined by the legislation. These include, among others, whether these funds can cover operations or whether they are exclusively for infrastructure development and how decisions are to be made about projects, which run through multiple MoDot regions such as the Amtrak route. A concern for transit advocates is that “tweaking” of the legislation over the next couple of months might result in restrictions on the use of funds for non-highway modes. It will be important for transit advocates to stay informed about the legislation as it makes its way through the legislative process. 2. MoDot will hold “listening sessions” around the state to update the “Missouri On The Move” (MOTM) long-range plan. The report from the listening sessions will not be done in time to inform the project listing for the general assembly. The listening sessions are for the MoDot’s long-range transportation plan, not necessarily for the project list related to this possible legislation. We expect MoDot districts will make up the lists for the legislation with MPO/RPC input if they assert themselves. The Kansas City area listening sessions are scheduled for March 12-13-14, locations to be determined. Transit advocates, in concert with MARC, transit agencies, and local and county governments should set priorities and be at the table along with highway interests for these sessions. Getting projects on the list is crucial. In the event voters pass the proposal, however it’s prospects may seem today, that list will represent the State’s transportation plan for the next ten years and be difficult to amend. This proposal represents a shift in the state from user fees to dedicated sales tax revenue for new transportation funds. At this point, there is no pot of money reserved for transit and passenger rail. Gasoline is exempt from the sales tax, while current gas tax is among the lowest in the country – #45. Sales tax is often used as a revenue stream for cities and counties and a state sales tax would impact the ability of local municipalities to pass local sales tax initiatives. There is a prohibition against tolling. Rural I-70 would be funded statewide but urban portions have to be funded from district allocations. Sen. Schatz (chair of the House Transportation Committee) scheduled a full committee hearing on HJR 23, sponsored by Rep. Dave Hinson. 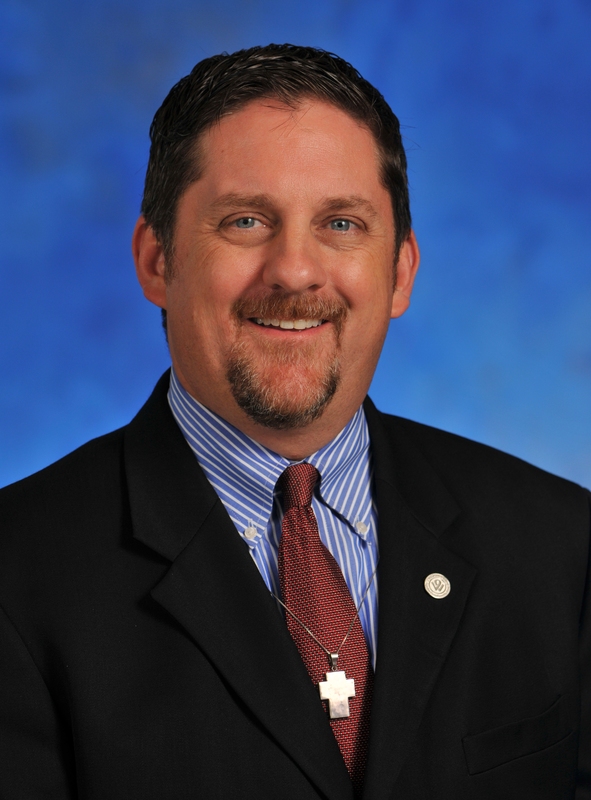 Sen. Kehoe (chair of the Senate Transportation Committee) scheduled a full committee hearing on his bill, SJR 16. Chief Engineer Dave Nichols (number 2 man at MoDOT) will make a presentation on MOTM at the Total Transportation Policy Committee (TTPC) Tuesday, February 19 at 9:30 at MARC. The public is invited and encouraged to attend. The venue holds 70 people. Transit advocates could ask candidates questions about making improvements to the transit system in Wyandotte County, plans to maintain or increase funding even if federal or state funds dry up, and how will they make Village West more transit-friendly. TAN is having an online transit forum with the KCK mayoral candidates, similar to our 2011 mayoral forum for KCMO. We have already sent the questionnaire to the candidates and we will post their responses next week. 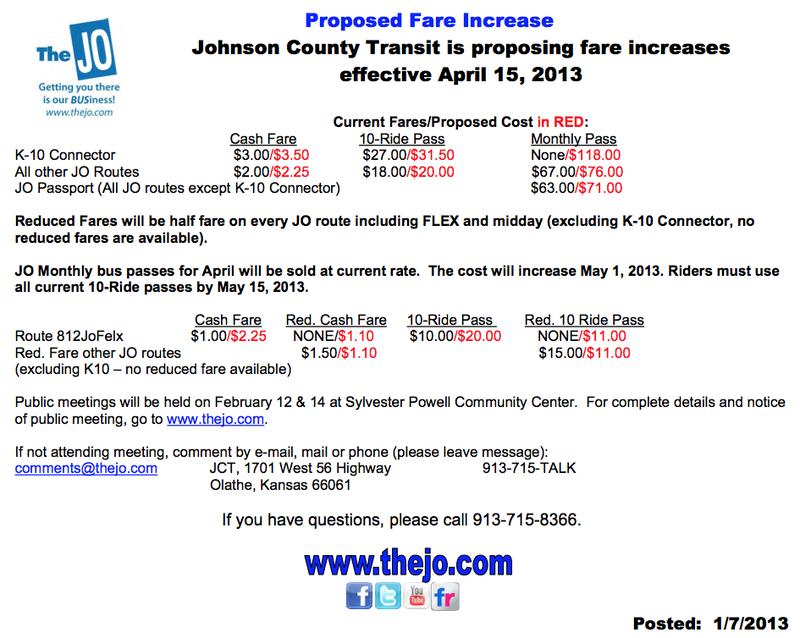 Johnson County Transit is proposing a fare increase effective April 15, 2013. Public meetings are being held this week. Proposed cash fares increases are 50 cents for K-10 and 25 cents for most other routes. There is an anomaly though because the proposed cash fare increase for Route 812/Jo Flex is $1.25, which is significantly more than the other fare increases. Low-income people living in HUD section 8 housing in Overland Park mainly use this route to get groceries, medicines and other basic needs. We discussed this route in our Title VI claim dealing with the service cuts. Johnson County does not classify this route as low-income but TAN disagrees. This fare increase appears to place a disproportionate burden on the low-income people who use this route. Here are the percentage increases to the base cash fares. Equity – Although it is obvious that JCT is proposing that all the non K-10 routes have the same base fare of $2.25, we are concerned that this could create an Environmental Justice issue. We will have to see if the FTA decides that Route 812/Jo Flex is indeed a low-income route. Different modes of transit service may have different fares without being discriminatory. Route 812/Jo Flex mainly serves low-income people two days a week for 4 hours, so it hardly seems fair to increase their base fare 125% just to make it the same as the standard and commuter express routes for daily commuters. For riders of Route 812/Jo Flex over 60 years old, they can get relief from the high increase if they purchase a 10 ride reduced fare pass. However, younger low-income people will feel the full brunt of this increase. Process – We wonder when public meetings will be held in the KCK or KCMO areas that JCT serves? How do riders or potential riders using a reverse commute and needing a northbound bus after 6:30 pm, when this meeting ends, get to KCK or KCMO using transit? We hope there was a public meeting in Lawrence. Inadequate public participation was the basis of our Title VI claim for the service cuts and we see similar problems with the process for the fare increase. Fare Structure – We question the wisdom of continuing a fare structure under which very long morning / evening commuter trips from Gardner or Olathe via I-35 have the same fare as much shorter “errand” trips on local streets, such as the 75th Street – Quivira and Metcalf – Shawnee Mission Parkway routes. KCATA has two categories of routes — regular ($1.50 fare) and commuter (generally $3.00). 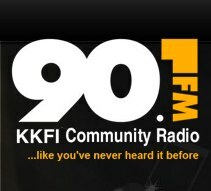 EcoRadio on KKFI Community Radio, 90.1 FM, discusses transit issues in the Kansas City region on Monday, Feb 11 at 6 pm with TAN co-founder, Ron McLinden. There are only three public budget hearings about the city manager’s proposed budget. Tell your Council Members and the Mayor that the failure to “incrementally increase” the KCATA budget toward 95% of the available money is unacceptable and against the wishes of the voters. People depend on this service for all aspects of their lives including getting to work and school, buying groceries and medicines, and going to the doctor. The Kansas City Area Transportation Authority (KCATA) announced that 2012 Metro ridership exceeded 16.1 million trips, the second highest annual ridership in nearly two decades. The Metro is an essential service. The city has not “incrementally increased” the percentage that KCATA is receiving despite what the ordinance instructs the city manager to do. KCATA received 74% when the ordinance was passed in 2010. Funding for KCATA has to be at 95% by May 2014. The city manager’s budget is only proposing 71% for KCATA, which is less than when the ordinance was passed. If the KCATA budget was “incrementally increased” after the ordinance, then it should receive close to 88% in this budget. Message to Mayor James – This proposed budget has increased the amount being diverted to non-transit uses to $6 million. If the city doesn’t follow the ordinance, KCATA will need to subsidize the city’s bus service $5 million this year to maintain this service level. KCATA continues to provide more transit service than the city is paying for. KCATA is using up its emergency reserve account to pick up the difference. KCMO should stop dragging its feet and use the taxes the way the voters intended. 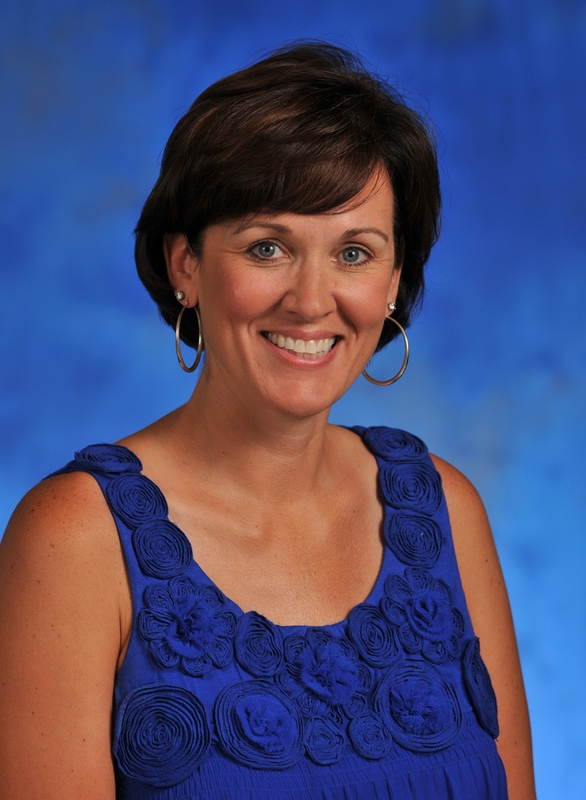 To hear more about this issue, TAN advocate Janet Rogers will be a guest on two KKFI radio shows to talk about what is happening to KCATA funding and why the proposed budget needs to be changed.